Are Wolves Better Problem Solvers Than Dogs? From a young age, human children learn that a rattle won’t make a noise until it’s shaken, and that placing fingers on a hot stove is a terrible idea. New research suggests that wolves, like humans, have a knack for identifying these kinds of cause-and-effect relationships, but that domesticated dogs do not. This finding suggests that domestication may have debilitated doggie brains, but there are other possible factors to consider as well. Wolves seem to be better than dogs at understanding cause and effect relationships, and both wolves and dogs appear equally good at understanding the meaning behind communicative signals such as pointing, according to new research published in Scientific Reports. Behavioral experiments led by Radboud University’s Michelle Lampe demonstrated that wolves, unlike their domesticated cousins, have an ingrained knack for making causal inferences about where food was hidden. That domestication may have altered the brain power of dogs shouldn’t be shocking. Unlike wolves, who have to make a honest living fending for themselves in the wild, dogs are largely dependent on humans for virtually all aspects of life—particularly the acquisition of food. They haven’t been under the same evolutionary pressures as wolves, so it’s plausible that dog brains are now somehow different. Plus, dog breeders have been selecting for physical and behavioral characteristics that have very little to do with self-sufficiency in the wild. All that said, behaviors can’t always be directly tied to intelligence. There may be something else going on in those doggie brains that’s accounting for their apparent cognitive shortcomings. The new study, which also involved researchers from the University of Veterinary Medicine in Vienna, the Max Planck Institute, and the University of Portsmouth, compared wolves and dogs raised in similar environments. The scientists evaluated the reasoning abilities of 12 pet dogs and another 14 dogs raised like wolves in a pack, along with 12 human-socialized wolves. “Our study is unique as it does not only compare dogs and wolves living under identical conditions, with a same history and training regime,” said study co-author Juliane Bräuer. “We also compared dogs living in packs to pets living with their human families.” This meant that the researchers could tease apart the influence of domestication from raising and living conditions—an experimental design set-up that they claim had never been attempted before. In tests, the animals had to choose between a pair of objects—one containing a food reward, and one that was completely empty. The researchers sought to determine if dogs and wolves could use various cues to figure out which container to choose. These cues came in three varieties: communicative cues, such as eye contact and pointing, behavioral cues, such as a human reaching for or sniffing a container, and causal cues, where, in the absence of a human, the container with food made a noise when shaken (i.e. cause-and-effect). 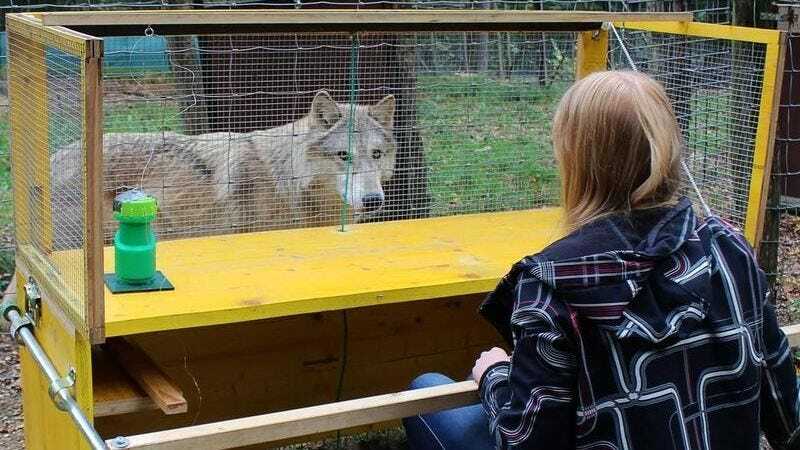 Both the dogs and the wolves were able to understand the communicative cues to find the hidden food, but in the case of behavioral cues without direct eye-contact, neither the dogs or the wolves selected the correct object. When exposed to the causal cues (the shaking bottle), the wolves displayed a high understanding of cause and effect, not requiring a human intervener to show them where the food was hidden (unlike the dogs, who always required a human to succeed). So does this mean that dogs are stupider than wolves? Possibly. But we’re going to need more than one behavioral study to prove such a claim. Comparative brain scans and genetic analyses of the two species could also help. But there may be something else going on here. Previous work has shown that wolves have a greater drive to explore and remain focused on tasks compared to dogs. What this could means is that domesticated dogs are not less intelligent than wolves, it’s just that they don’t take the extra effort, or they lack the required level of curiosity, to solve problems. “It can’t be ruled out that the differences could be due to wolves being more persistent in exploring than dogs, said Lampe. This could be a kind of ingrained learned helplessness—one acquired through thousands of years of artificial selection, and possibly through the instinctual behaviors of the very first ancestral wolves who left their pack mates and made humans their best friends. Or, there could be something about the domestication of dogs that has truly caused them to become less intelligent. More research will be required to suss this all out. This experiment also allowed the researchers to compare dogs living in packs to dogs living with human families. Results showed that pet dogs don’t have an increased ability to understand human communication, a finding that’s consistent with previous research. We know that wolves, like dogs, are really good at responding to visual cues, such as following a person’s gaze off into the distance, or responding to a pointing gesture. And in fact, it’s the ability of ancestral wolves to comprehend communication cues that may have contributed to their domestication. Finally, it’s important to highlight some of the other caveats to this study. The 26 dogs and 12 wolves represent a small sample size, but while more would be better, it’s admittedly hard to find socialized wolves and dogs raised in packs (this study was made possible by the Wolf Science Center in Austria). Also, every animal used in this study was socialized to humans; no wild wolf was included in the experiment. Lastly, dogs are not descended from modern wolves, making direct comparisons of behavior difficult; both dogs and wolves are descended from a common ancestor that lived somewhere between 15,000 to 36,00 years ago. We reached out to several experts for their takes on this study, and we’ll update this post once we hear back. Correction: A previous version of the post incorrectly described a total sample pool of 14 dogs, when it was actually 26. Sorry for the error. What Happens to Wolves When They&apos;re Raised Like Dogs?